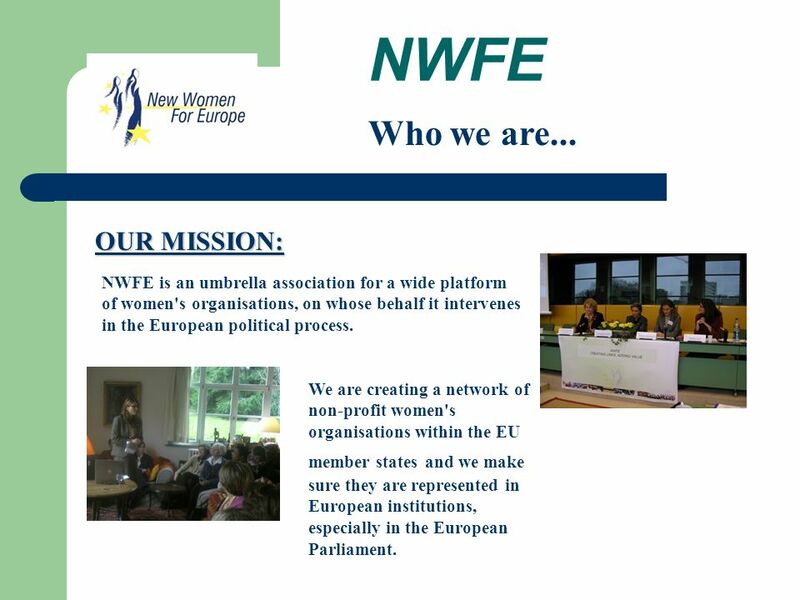 2 NWFE Who we are... NWFE is an umbrella association for a wide platform of women's organisations, on whose behalf it intervenes in the European political process. 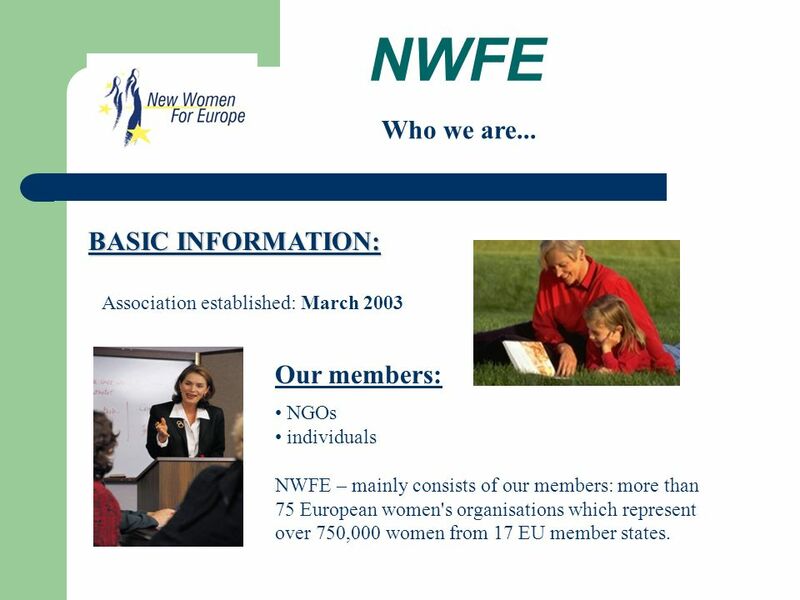 OUR MISSION: We are creating a network of non-profit women's organisations within the EU member states and we make sure they are represented in European institutions, especially in the European Parliament. 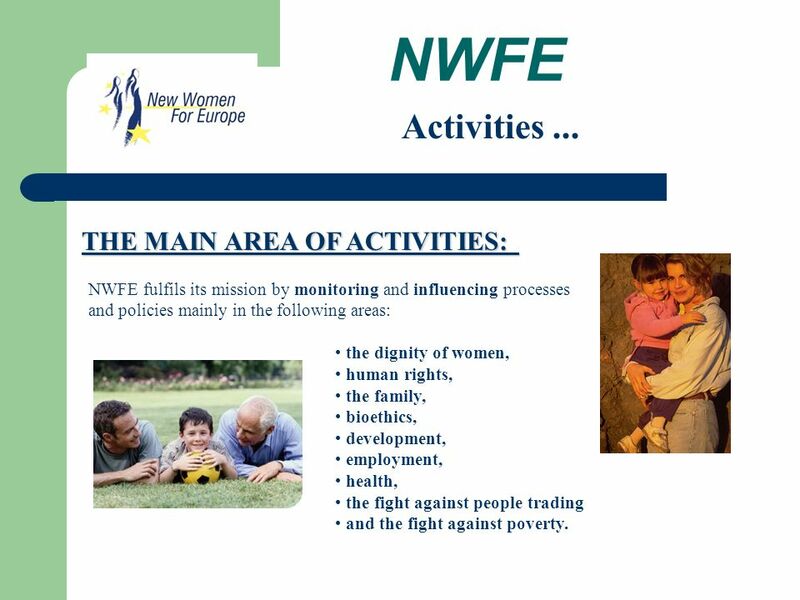 4 NWFE NWFE fulfils its mission by monitoring and influencing processes and policies mainly in the following areas: THE MAIN AREA OF ACTIVITIES: Activities... the dignity of women, human rights, the family, bioethics, development, employment, health, the fight against people trading and the fight against poverty. 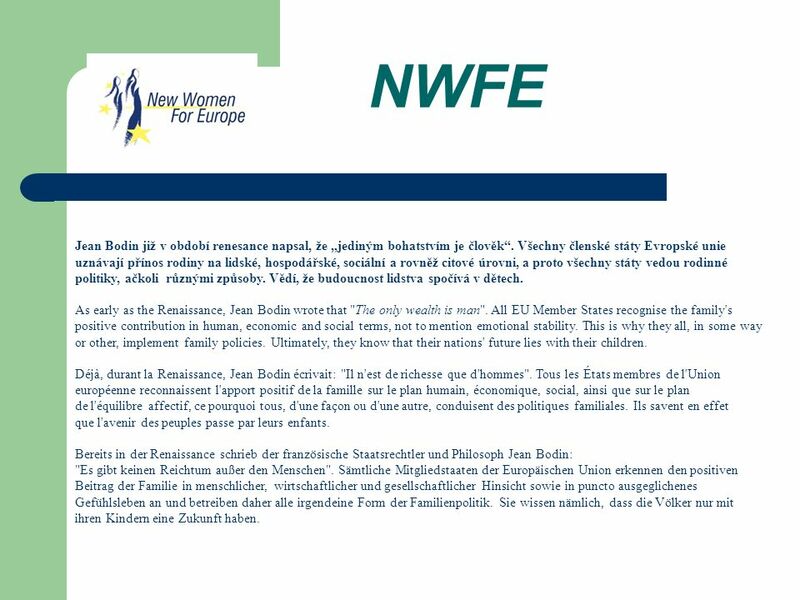 6 NWFE Je třeba zdůraznit roli rodiny při vytváření lidského kapitálu díky poskytnutému vzdělání, předaným hodnotám a podpoře, kterou rodiče dětem přinesli. Některé přednosti nepostradatelné v pracovním i sociálním životě se nejprve získávají v rodině: úcta k ostatním, smysl pro píli, týmový duch, tolerance, smysl pro život ve společnosti a odpovědná nezávislost; We should also stress the contribution the family makes to "human capital" through the education and values it imparts and the support and stimulus the parents provide for their children. Qualities that will be crucial to professional as well as social life are acquired in the family: respect for others, making an effort, team spirit, tolerance, social behaviour, responsible independence, etc. Il faut aussi souligner le rôle de la famille dans la valeur du "capital humain" grâce à l'éducation donnée, aux valeurs transmises, au soutien et à la stimulation apportés par les parents aux enfants. Certaines qualités indispensables dans la vie professionnelle, comme dans la vie sociale, s'acquièrent d'abord au sein de la famille: le respect de l'autre, le sens de l'effort, l'esprit d'équipe, la tolérance, le sens de la vie en société, l'autonomie responsable; Unterstrichen sei auch die Rolle der Familie für den Wert des "Humankapitals", indem die Eltern ihre Kinder erziehen, ihnen Werte vermitteln, sie fördern und ihnen Anregun­gen geben... Bestimmte in Beruf und Gesellschaft unverzichtbare Stärken werden zu­nächst in der Familie erworben: Respekt für andere, Leistungsfähigkeit, Teamgeist, Tole­ranz, soziale Kompetenz, verantwortungsvolle Autonomie. 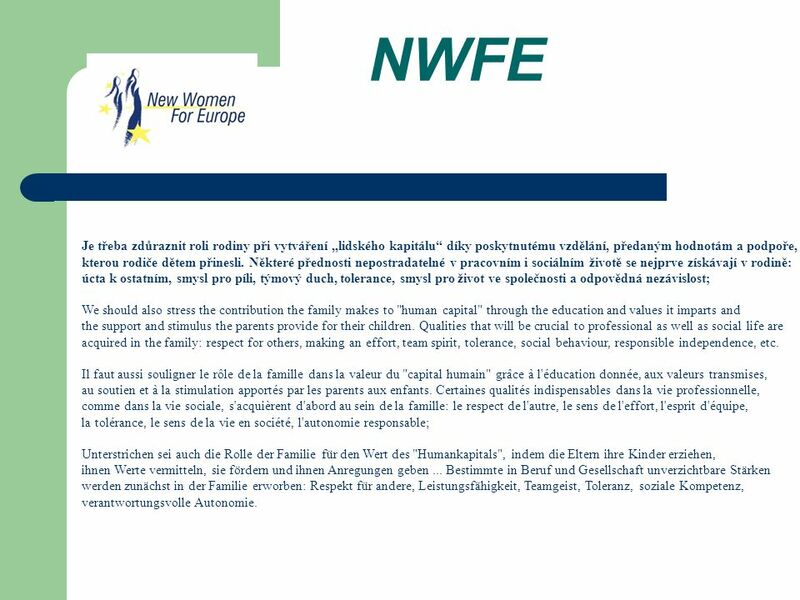 7 NWFE Jean Bodin již v období renesance napsal, že jediným bohatstvím je člověk. Všechny členské státy Evropské unie uznávají přínos rodiny na lidské, hospodářské, sociální a rovněž citové úrovni, a proto všechny státy vedou rodinné politiky, ačkoli různými způsoby. Vědí, že budoucnost lidstva spočívá v dětech. As early as the Renaissance, Jean Bodin wrote that "The only wealth is man". 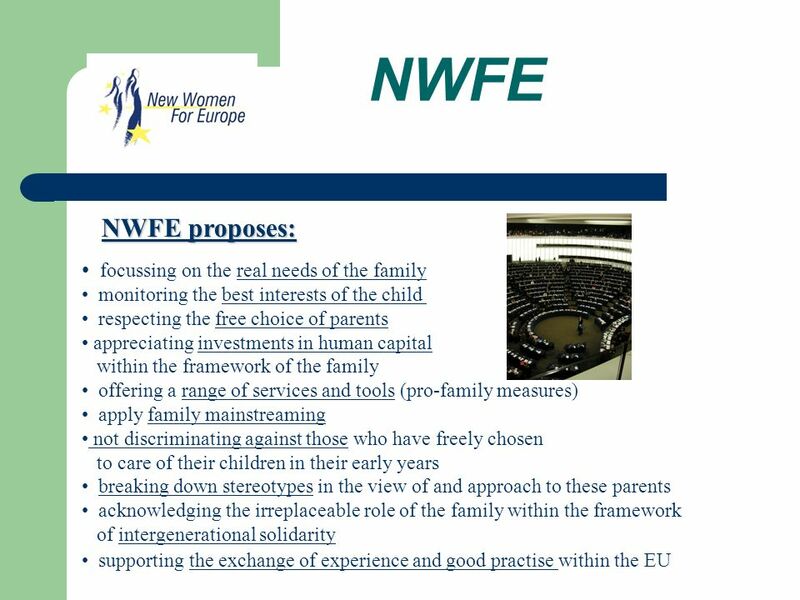 All EU Member States recognise the family's positive contribution in human, economic and social terms, not to mention emotional stability. This is why they all, in some way or other, implement family policies. Ultimately, they know that their nations' future lies with their children. Déjà, durant la Renaissance, Jean Bodin écrivait: "Il n'est de richesse que d'hommes". 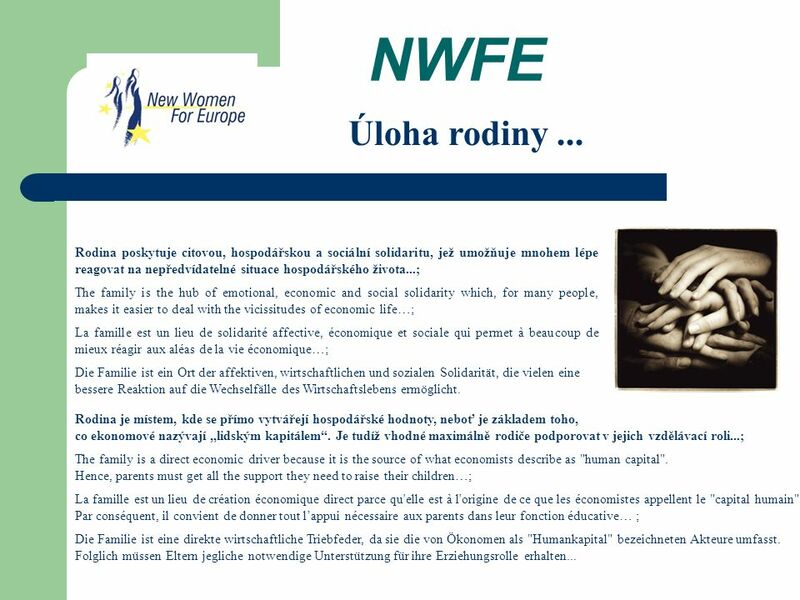 Tous les États membres de l'Union européenne reconnaissent l'apport positif de la famille sur le plan humain, économique, social, ainsi que sur le plan de l'équilibre affectif, ce pourquoi tous, d'une façon ou d'une autre, conduisent des politiques familiales. Ils savent en effet que l'avenir des peuples passe par leurs enfants. Bereits in der Renaissance schrieb der französische Staatsrechtler und Philosoph Jean Bodin: "Es gibt keinen Reichtum außer den Menschen". Sämtliche Mitgliedstaaten der Europäischen Union erkennen den positiven Beitrag der Familie in menschlicher, wirtschaftlicher und ge­sellschaftlicher Hinsicht sowie in puncto ausgeglichenes Gefühlsleben an und betreiben daher alle irgendeine Form der Familienpolitik. Sie wissen nämlich, dass die Völker nur mit ihren Kindern eine Zukunft haben. 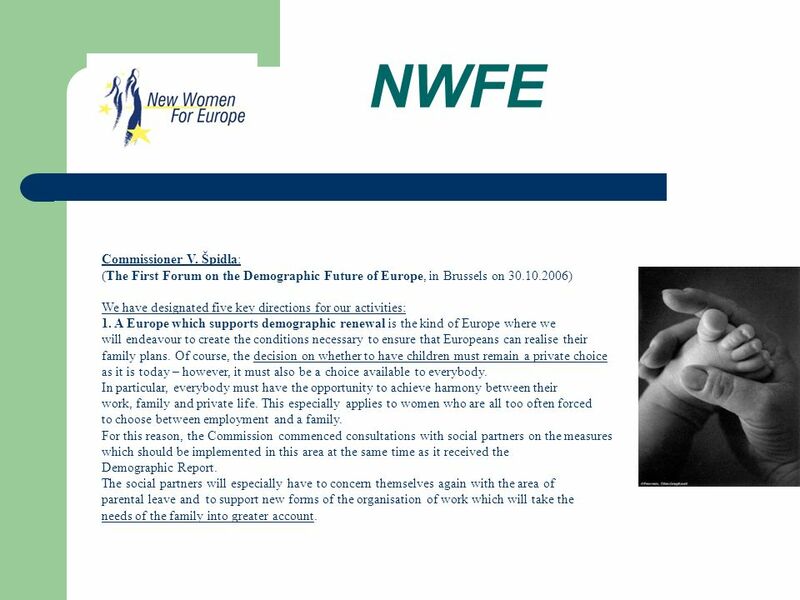 9 NWFE Commissioner V. Špidla: (The First Forum on the Demographic Future of Europe, in Brussels on 30.10.2006) We have designated five key directions for our activities: 1. 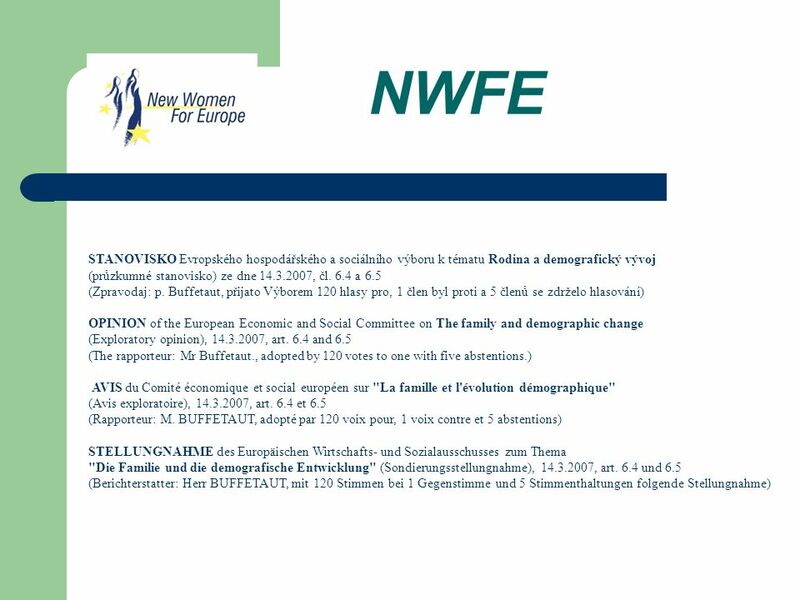 A Europe which supports demographic renewal is the kind of Europe where we will endeavour to create the conditions necessary to ensure that Europeans can realise their family plans. 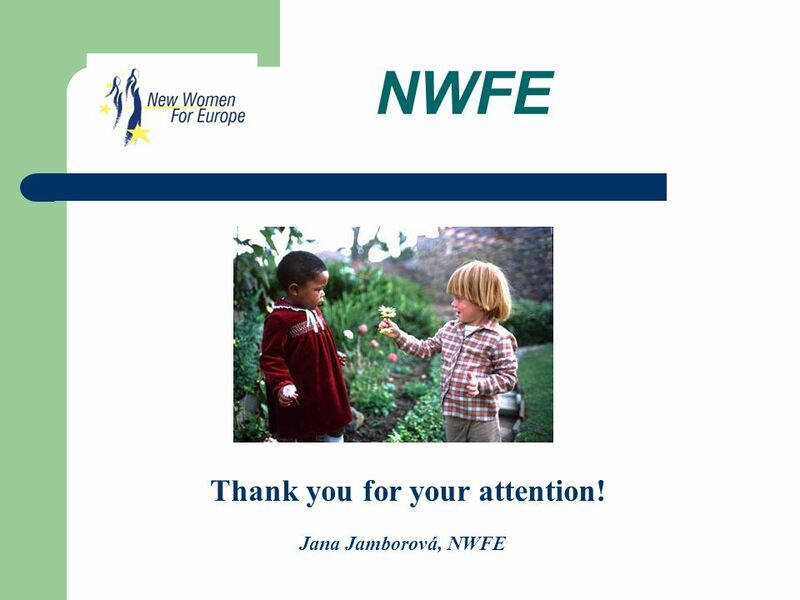 Of course, the decision on whether to have children must remain a private choice as it is today – however, it must also be a choice available to everybody. In particular, everybody must have the opportunity to achieve harmony between their work, family and private life. This especially applies to women who are all too often forced to choose between employment and a family. For this reason, the Commission commenced consultations with social partners on the measures which should be implemented in this area at the same time as it received the Demographic Report. The social partners will especially have to concern themselves again with the area of parental leave and to support new forms of the organisation of work which will take the needs of the family into greater account. 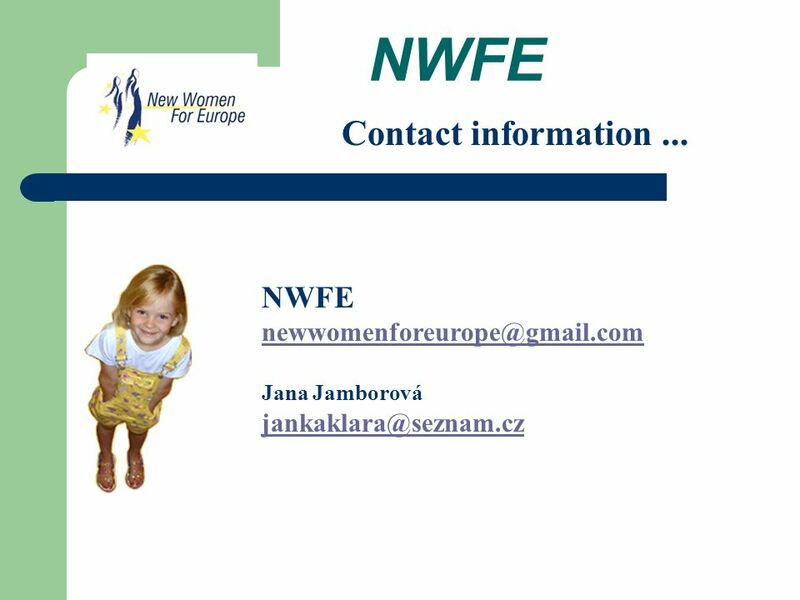 Stáhnout ppt "NWFE New Women for Europe " Who do our children belong to or do we want the best for the smallest and the weakest? " Prague, 6th February 2009 Jana Jamborová,"
Copyright, © Eurist s.r.o. EKRK goes Europe Strategy Concerning the European Union and the position of Real estate brokers presented by: Matthieu. Základní technická terminologie Poznámka: značka * za slovem znamená pokračování kliknutím, zbytek je načasován. NázevThe United Kingdom – Northern Ireland Předmět, ročník Seminář z anglického jazyka, septima Tematická oblast Reálie anglicky mluvících zemí I. AnotaceJedná.